NEW YORK (CNNMoney.com) -- Casual clothing chain American Apparel, suffering a steep sales slump and manufacturing problems, warned Tuesday that it might default on loans and not be able to stay in business. The Los Angeles-based maker and seller of "Made in U.S.A" T-shirts and other basic fashion clothing, said it may default on loan agreements with its lenders, cited ongoing weakness in its business. If that happens, the company said it may not have sufficient liquidity to stay in business for the next 12 months. 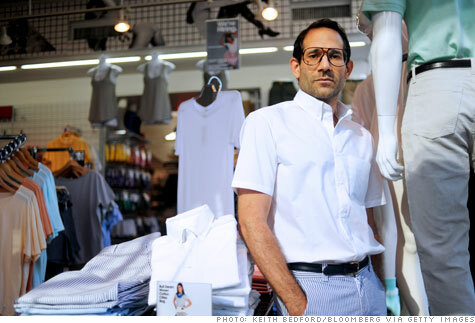 The news pushed American Apparel (APP) shares down more than 22% in late trading. The company, which operates 279 stores in 20 countries, said it expects same-store sales, or sales at its stores open at least a year, to tumble 16% in its second quarter. The company expects to post a loss from operations of between $5 million to $7 million in the quarter. It also warned that losses from operations would continue into its third quarter. American Apparel said it is in talks with its creditors to amend its credit agreements in an effort to not default on its loans. The company also said its former accounting firm Deloitte & Touche is investigating the "reliability" of the company's consolidated financial statements for all of 2009, the company's financial results for the first quarter of 2010 and its projected financial results for the remainder of 2010. Deloitte resigned as American Apparel's accounting firm on July 22. Can it market itself out of trouble? American Apparel is no stranger to controversy. The company's founder and CEO Dov Charney has faced sexual harassment suits and allegedly conducted interviews and company meetings in his underwear. Last year, the company settled a lawsuit with actor-director Woody Allen for $5 million after Allen sued American Apparel for unauthorized use of his image on billboards. But instead of hurting the company's brand, controversy has seemed to work in its favor, turning American Apparel into an iconic fashion brand that created a cult-like status with teens and young adults. "What Charney did was turn basic clothing into an iconic brand and it was terrific for the company. I applaud him for it, said Marshal Cohen, chief retail analyst with NPD Group. Cohen said Charney was among the first merchandisers to really capitalize on social media and controversial marketing, and he put American Apparel stores in unexpected locations. "He marketed the brand into success but can he really market it out of trouble," said Cohen. Cohen has his doubts. "In this economy, conspicuous consumption is dead," he said. "It's no longer enough to rely on your marketing and imagery to get people to buy your products." As consumers across the board struggle with less spending money, Cohen said younger shoppers especially are trading down to cheaper fashion alternatives. "Consumers are now shopping for their basic clothing at places like Target (TGT, Fortune 500)," he said.